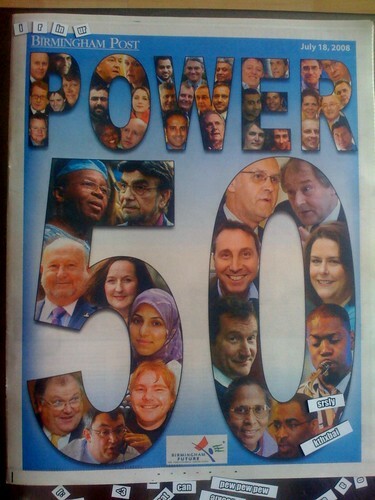 Last year‘s Birmingham Post Power Fifty caused a lot of fun in offices around the city. I remember Chas Watkin (Editor of Midlands Today) being referred to as “number 48” by his newsroom staff for a few days, which is alright unless you’re the second “most powerful” and get people sniggering “number two” behind your back. I went to the launch of this year’s list, where Marc Reeves of the Post admitted that it was designed to “infuriate” and stimulate debate (and one would hope from his point of view stimulate paper sales and website traffic). The Post have been brave and put the entire list up online, with open comments on each entrant (it’s a bit flaky at the moment — the paging system doesn’t work and the images are missing, but the list is there and you can comment on it). One can only hope their moderators are up to the task of the heated debate. Reading the list, and especially listening to the top ten being announced, it strikes you how difficult it would be to work out a list of people in order of real ‘power’ (influence is a better term, I think). You’d probably be right in thinking that George W. Bush or whoever the hell is EU President at the moment (or any number of bureaucrats in Whitehall, Brussels etc) have more power over Birmingham than any of those listed, that’s kinda not the point. In one way it’s a celebration of the people in Birmingham that work really hard, without recognition in a lot of cases, and do good things for the city. Whether they do that purposely or it just happens while they’re going about their business, or it is their job, like number 8 Mike Whitby. Created in Birmingham have pulled out the “creatives” in the list, which makes for a interesting reading. There are few people going up (or down) one or two places since last year — like the NME Cool List, the idea is to create talking points so if someone is doing what they were last year, just a little better or worse then it’s more fun to leave them out and give the space to someone whose “power” will ruffle a few feathers. Which is why, I’m guessing, I make an appearance at number 14. It’s not really me, it’s the idea of blogging and citizen journalism that is in the list. It’s making a point about how fast the media landscape is changing. For Brum, it’s everyone that gets this, everyone that is cynical abut the way news it presented to us. Everyone that likes to do their own digging or add their own take. They just happen to have some library photos of me waving my arms about by Selfridges. I’ll not be on it next year, mark my words. ← Pallasades owners to throw spanner into New St revamp? Intention: Marc Reeves of the Post admitted that it was designed to “infuriate”. Result: That is lazy or extremely sloppy journalism and, perhaps makes a little point for us about how the mainstream press are dropping the ball and allowing bloggers to make such huge inroads.